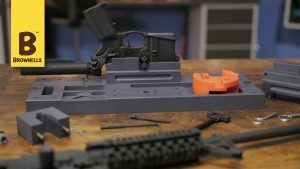 Present Arms AR15 Gunners Mount – (follow the link to the left and watch Brownells video) Gunners Mount, Platform with receivers and pockets for rifle, carbine, and pistol repairs. The ideal platform to work AR15 M4 M-16 lowers. Assemble, disassemble, and repair. Parts pockets are cut to prevent runaway components and a slot for supporting magazines when making repairs. The platform will also accommodate pistol magazine posts and other magazine fed weapon systems. 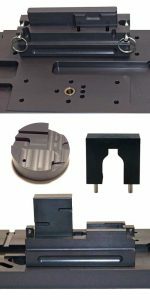 Upper Repair Fixture Mount, with supports for dust cover and bolt assist removal – The Upper mount is machined from synthetic, non-marring polymer, giving added support both inside and out for distribution of loading as a result of repairs. Ball de-tent pins are provided to securely hold the upper by way of for and aft takedown points. Vertical pins are installed to hold the dust cover in a horizontal position for ease in assembly and disassembly of ejection port parts. Machine cut to allow HK416 dust cover vertical pin and fwd assist retention pin free fall from assemble into parts pocket. Our Patent Pending Upper mount securely holds the upper for optics, forward assist and dust cover repairs. 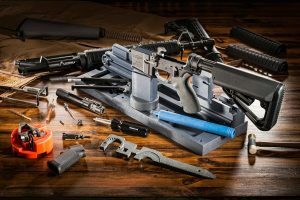 AR15 Lower Repair Fixture Mount, enables lower receiver to be inverted and worked on the same mount– AR Lower Repair Fixture Mount is machined from synthetic non-marring polymer providing added support inside and out of the lower receiver. Securely held when pinned with the takedown and pivot pins of the receiver. The receiver can be mounted in both upright and inverted position for full access when assembling and disassembling . Use with our Patent Pending Receiver Alignment Block. Ensuring correct 12-6 alignment of the receiver extension tube . Ensure correct stock alignment. The perfect platform and mount for the armorer. AR15 Magazine Post w/pins for Gunners Mount- The MP-AR-1 firmly holds your AR-15 in the center of our Gunners Mount Plus. 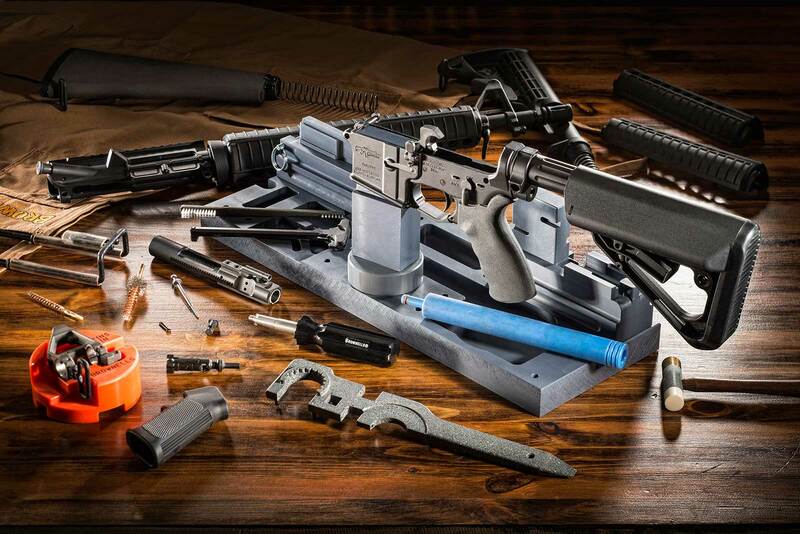 This mount gives you a solid base for working on your AR-15. Made of a tough polymer it will not mar or scratch your firearm. Receiver Extension Alignment Block- Aligns receiver extension at the 12 O’clock position when tightening down the receiver extension nut. The Gunner’s Mount is the base platform of our Patent Pending family of firearm workstations. Our systems are tool-less, ergonomically designed and cost effective, complete with AR15 Magazine post and large swivel. 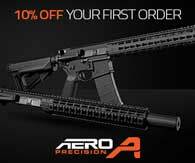 Ideal for building AR’s or servicing your rifle. The Lower Receiver Block – LRB securely holds receiver with takedown and pivot pins. Receiver can be mounted in both upright and inverted position for full access when assembling and disassembling. Use with our Receiver Alignment Block. Ensuring correct 12‐6 alignment of the receiver extension tube. Ensure correct stock alignment. The perfect platform and mount for the armorer. The Receiver Alignment Block – RAB is cut to the proﬁle of the receiver extension tube. With the Lower Receiver securely ﬁtted to the Lower Receiver Repair Block (AR15LRB) the receiver extension is held securely in a true 12-­6 position when taking up on the castle nut. Trigger Roll Pin Gunner’s Puck – The GP‐Trigger securely holds the lower receiver offering full support to the lower trigger guard lips when removing or installing the roll pin. The GP‐Trigger guides off the pistol grip. The lips are the weakest item on the receiver and can easily be snapped or fractured damaging the lower receiver.